1Zhengzhou Tobacco Research Institute of China National Tobacco Corporation, Zhengzhou 450001, P. R. China. 2State Key Laboratory for Conservation and Utilization of Bio-Resources in Yunnan, Yunnan University, Kunming, 650091, P. R. China. 3Biocontrol Engineering Research Center of Plant Disease and Pest, Yunnan University, Kunming, 650091, P. R. China. 4Pu’er Branch of Yunnan Tobacco Company, Pu’er, 665000, P. R. China. 5Biocontrol Engineering Research Center of Crop Disease and Pest, Yunnan Province, Kunming, 650091, P. R. China. *To whom correspondence should be addressed. E-mail: minghemo@163.com. Received 02 June, 2018; Received in revised form 25 June, 2018; Accepted 04 July, 2018. Green fluorescent protein, Soil microbiostasis, Pseudomonas aeruginosa. Soil bacteriostasis is a widespread phenomenon which negatively affects the survival, colonization and efficiency of bacterial agents in soil. 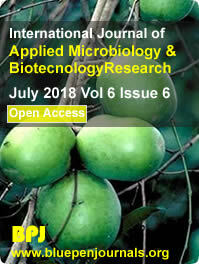 A novel green fluorescent protein (GFP)-based method was developed to assess the bacteriostasis intensity (BI) of soil towards the biocontrol agent Pseudomonas aeruginosa NXHG29. Transformation with GFP generated a strongly fluorescent strain, NXHG29-gfp. The population and growth of NXHG29-gfp under bacteriostatic stress were determined based on the appearance of fluorescent colonies and antibiotic resistance. By the GFP-based method, sixty samples of tobacco soil showed BIs of 8.7-29.4% against NXHG29-gfp, which positively correlated with the soil microbial diversity (r=0.97), pH value (r=0.78) and organic matter (r=0.78). This GFP-based method represents a convenient and accurate approach for soil bacteriostasis assay compared to standard traditional methods.